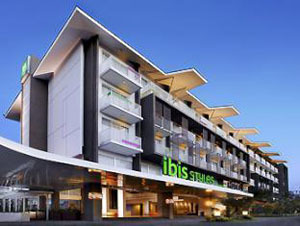 Ibis Styles Bali Benoa Hotel is one of the ibis hotel braches in Bali. Located at Jalan Pratama, this area is located at next to the sea in Tanjung Benoa which is famous as a water sport leisure area. From Ngurah Rai International Airport this hotel is 15 km or could be reached within 30 minute. It is also located within 10 minute drive to Bali Collection Shopping Mall and Bali Nusa Dua Covention Center in Nusa Dua. Ibis Styles Bali Benoa is the home of 174 comfortable and stylish rooms and suites each with modern interior design. The rooms are all designed having colorful style with a fresh look over the pool and surrounding. Facilities and entertainments like Air Conditioner, LCD TV screen, Safety deposit box, Fridge, Minibar, Tea and Coffee making facilities, and free WIFI Internet access are all available. There is also one room which is specially designed for people with reduced mobility. For your dining option Ibis Styles Bali Benoa Hotel provides the best place with the best dishes including The Ocean Restaurant and Pool side Splash Bar. The Ocean Restaurant provides a modern, open-air atmosphere and offers a truly interactive culinary experience combining the best of Balinese, Asian and Western Cuisine. Meanwhile, the Splash Pool Bar is an exclusive venue providing the perfect setting of sparkling cocktails, Mocktails, Wines, Beers, fruit juices and snacks while having a cool dip in the pool. For business facility, Ibis Styles Bali Benoa Hotel also provides a business centre located at the 2nd floor of the hotel. This business centre is designed to be able to support a full meeting, training, or small seminar. It is equipped with the latest meeting technology like video conferencing, projectors, sound system, and high speed internet access. There are various selections of the business rooms with different space and setting upon your request. Other services and facilities in this 3-star hotel including fitness centre with sauna, Wi-Fi access all over the place, bicycle rental, and parking area. Services like in-room massage or ticket/tour assistance are available upon request. I stayed there for 4 days. Nice and colourful place. Not quite in flow with the Bali culture and traditions, but more internationally styled. The staff are all young and cheerful. Dressed also in a more hep way rather than formal. Food wise, I only had the breakfast, which was quite disappointing. The pool is brilliant, and so are other facillities. Room Tip : The one with a balcon overseeing the beach. 3rd floor and above. ibis Styles is a very nice hotel. We enjoyed our time here and 2 nights was enough for us. There really isn’t much to do in Benoa which of course is not the hotels fault by any means. The staff were friendly and attentive, especially at the Splash Pool & Bar. I definitely recommend ibis Styles Bali Benoa, I just don’t recommend going to Benoa in general.